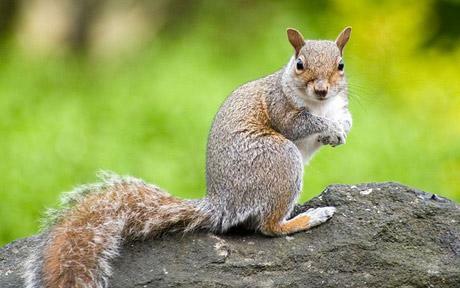 How DO I Get Rid of Squirrels from My Home and Garden? To some people, the above image is that of a cute little squirrel - a positive symbol of nature. To other people, it's just a nuisance. If you fall into the latter category, read on - we have ways to help eradicate such squirrels from your home and garden. The end-goal is making your garden, attic and/or surrounding trees squirrel-proof. Just dealing with squirrels in a reactionary way will mean you never really get rid of the problem. Squirrels usually gain entrance to attics and other structures from the roof,especially if tree branches offer a way onto the roof of a house. Therefore, look to trim those over-reaching branches to ensure any possible access to your home from a tree is made impossible for squirrels. If this can't be done, then consider sheet metal bands around the trunks of the surrounding trees to prevent squirrels from climbing them. These bands only have to be 2 feet wide to be effective, and a good 8 feet from the ground. Of course, live traps - such as the ones listed on our site - can be utilised to lower the squirrel population, or to remove individual squirrels from your home. Consider using fruit, nuts and seeds as bait.